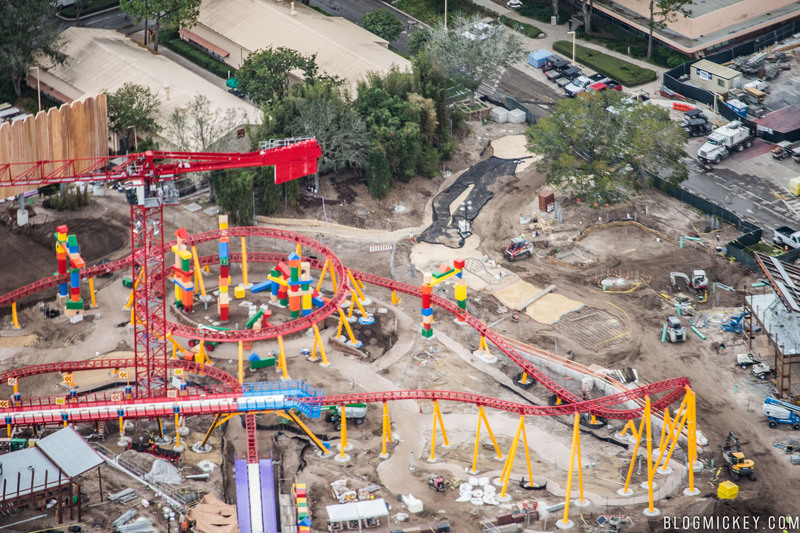 We took to the skies again today to check out the latest progress on Toy Story Land. 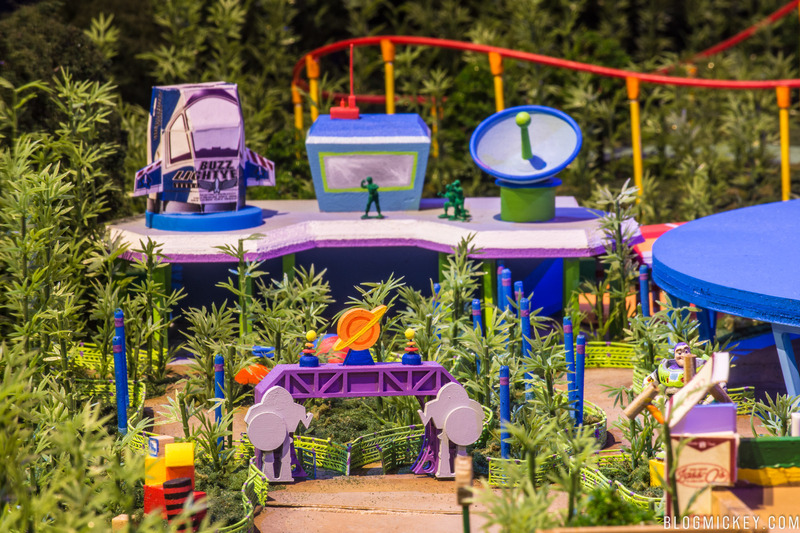 After seeing the Toy Story Land model at Walt Disney Presents, we couldn’t wait to see how the actual land is coming along! Let’s take a look. First, a few overview photos. It appears that most of the major elements of the land are in place. Since we last took to the skies, one of the two tower cranes was disassembled. We can also notice the progression on the coloring of the fence on the left-hand side of the photo below. A wide photo of the land as seen from a similar perspective as the model on display. As you can see the fence on the right of the land will be used to hide a very large Cast parking garage. Diving into some detail shots, we can see progress on the Alien Swirling Saucers building. The model shows us that Green Army Men will be perched atop, when completed. 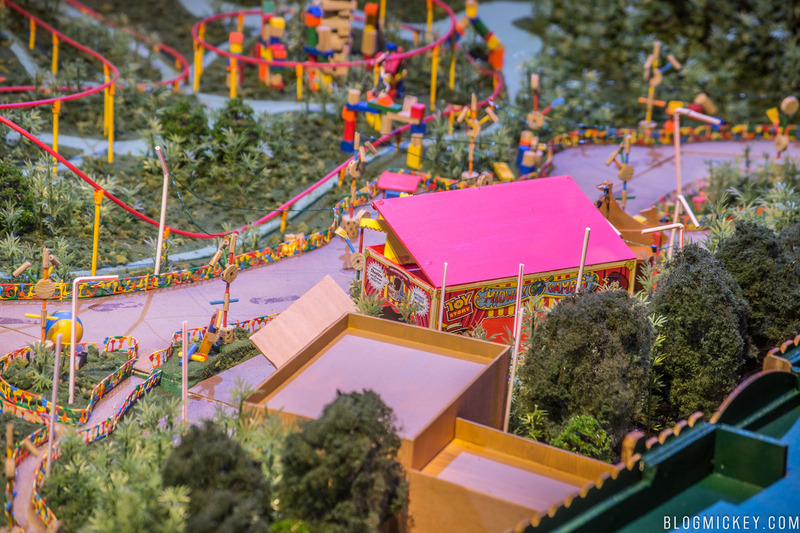 This shot of the model is from the reverse angle of the aerial photo. A closer look at the quick-service building. Details are still a bit scarce on the exact theming of the building and the offerings guests will be presented with. A look towards the new Toy Story Mania entrance reveals more progress on the “Midway Games” building. First, let’s take a look at the building in question in the model. It’s thought that the red building will be the new front of the attraction, with the tan building below it being the functional entrance to the show building. Now a look at the current progress. We can see the tan building connects between the two soundstages. 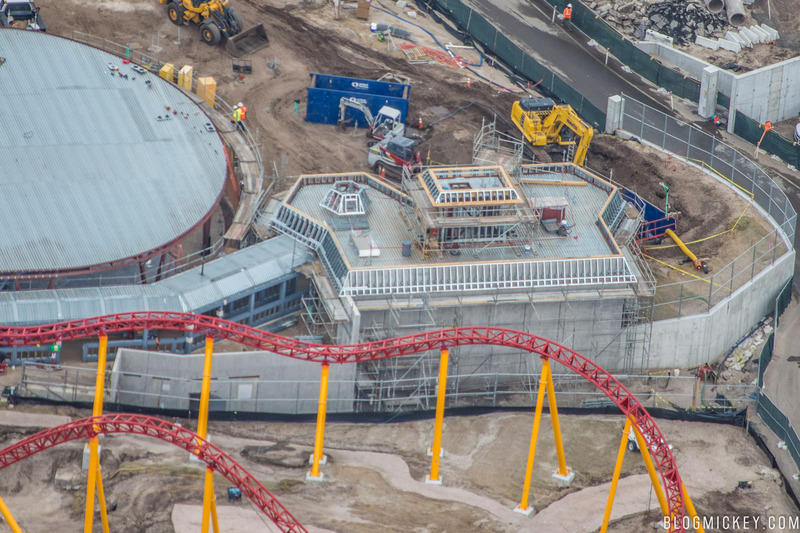 A look to the left of the entrance shows the skeleton of the red “Midway Games” building is now being constructed. 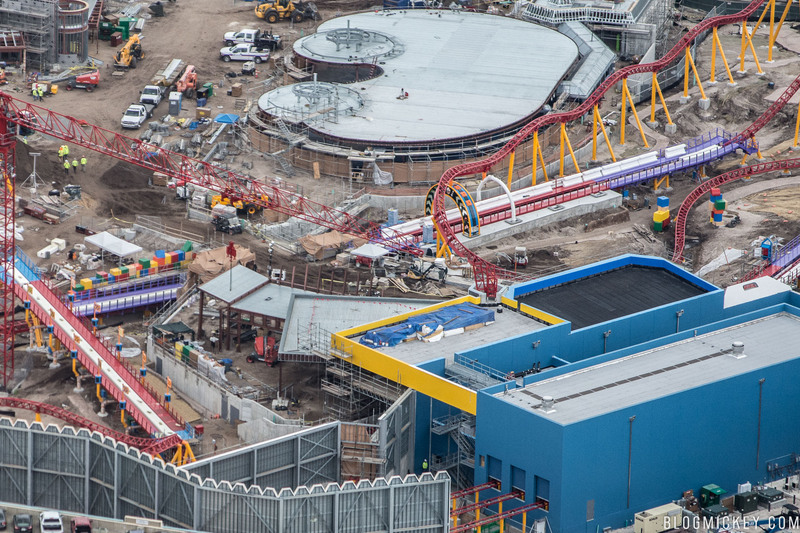 Making our way over to the Slinky Dog Dash facade, and we can see that there are racing flags on the track, a yellow trim added to the building, and even some extra track pieces on the top of the building. 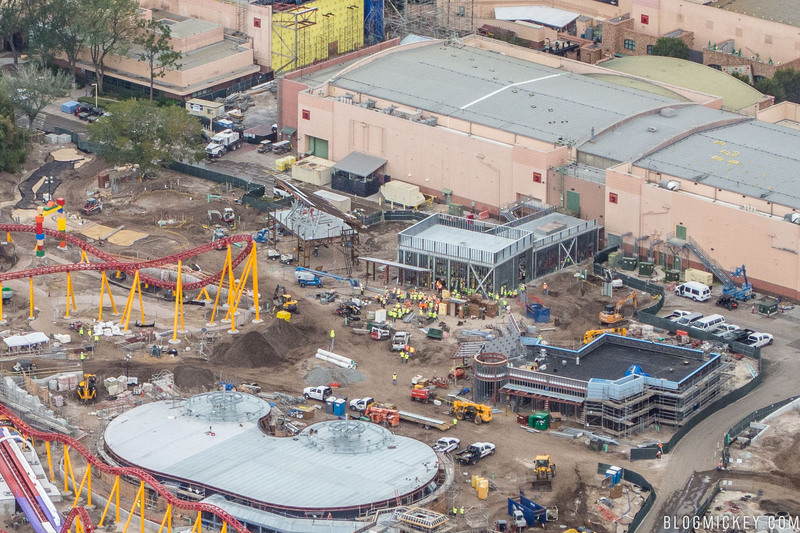 In the top of the photo, we can see that the Alien Swirling Saucers ride is now completely under cover. 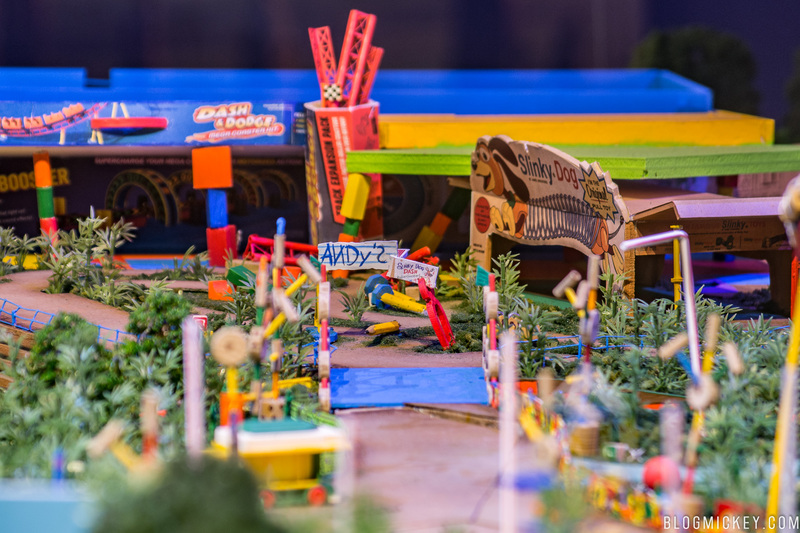 The extra track pieces are part of the Dash & Dodge track expansion pack as seen in the following photo of the model. 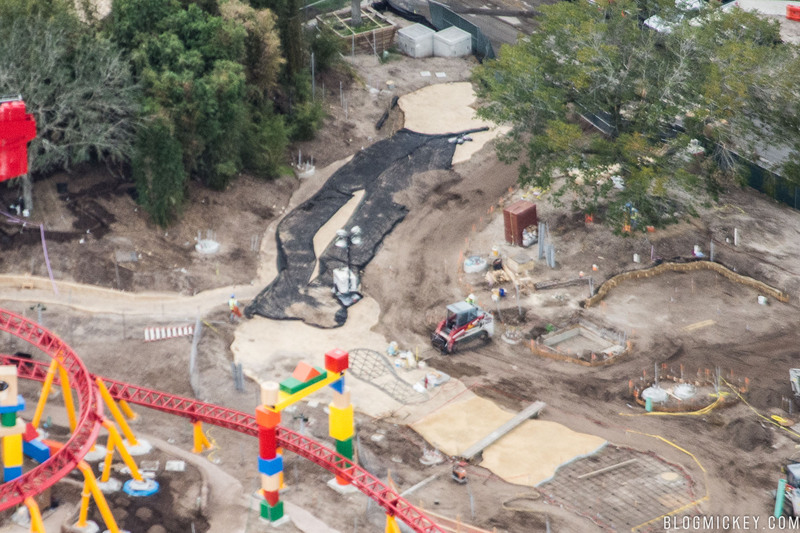 Finally, we noticed that the guest pathway is now being worked on. First, a wider shot of a section of the Slinky Dog Dash coaster theming elements. The above photo was already a cropped version of a wider photo, so my apologies when cropping further, but we noticed that the first of Andy’s footprints has been outlined. 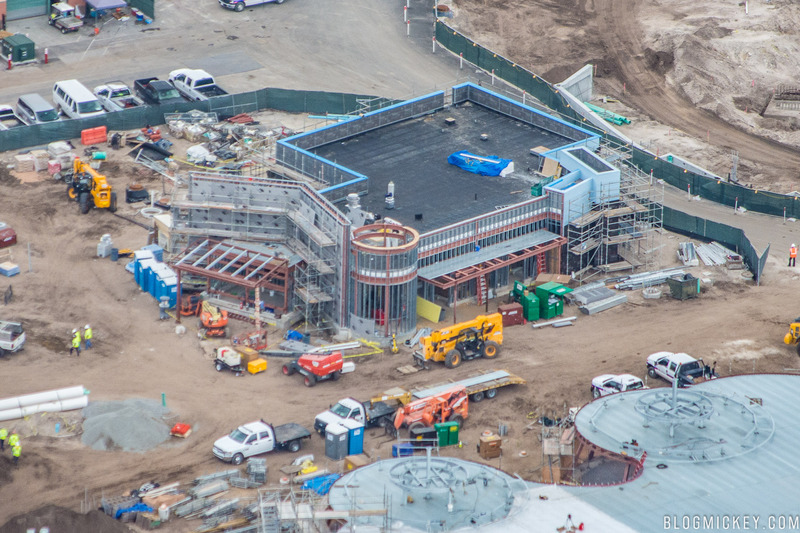 Stick with us as we continue to post aerial photo updates this week and in the coming months as work progresses on Toy Story Land, Star Wars: Galaxy’s Edge and other projects around Disney property.